Tukuna te reo kia rere noa! share common historical references to manu. What is the Te Tai Rāwhiti Investment plan? 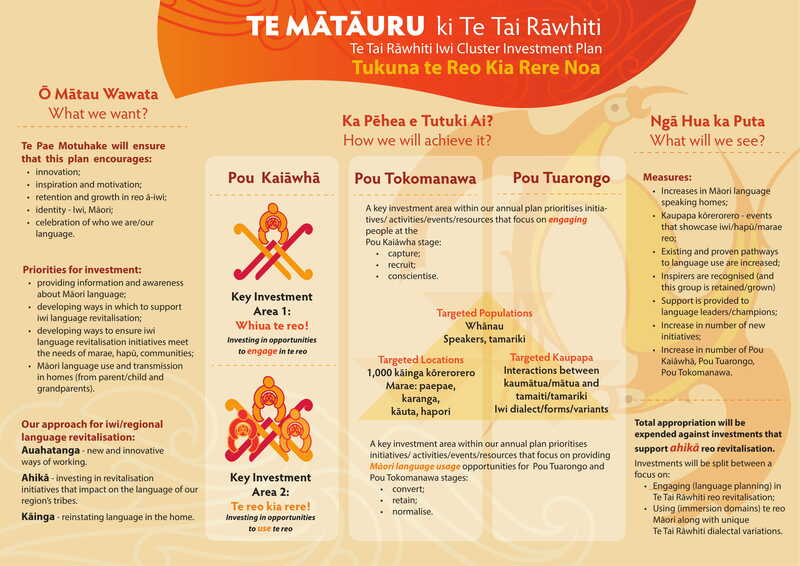 The Te Tai Rāwhiti Investment Plan 2018-2019 is the plan for how Te Mātāwai will be investing in te reo Māori revitalisation within the Te Tai Rāwhiti region on behalf of the iwi as prescribed in the Te Ture mō Te Reo Māori Act 2016. The Te Tai Rāwhiti Investment Plan was developed by a core group of te reo Māori advocates from within the Te Tai Rāwhiti region. The plan aligns with the Maihi Māori Strategy 2017-2040 with an overall vision to restore te reo Māori as a nurturing first language in homes and communities. Who is responsible for the Te Tai Rāwhiti Investment Plan 2018-2019? Te Pae Motuhake mō Te Tai Rāwhiti, representing iwi and Māori, is responsible for the plan and they will monitor the plan alongside Te Mātāwai. All Māori language stakeholders within Te Tai Rāwhiti and iwi listed in the Te Tai Rāwhiti cluster of iwi in “the Act” have a direct interest and responsibility in the implementation of the plan. How much is this total fund for Te Tai Rāwhiti? The Te Tai Rāwhiti Pae Motuhake will look to invest its entire appropriation of $1.08 million and make recommendations to the full Board of Te Mātāwai for approval. Investments will be split between a focus on Engaging (language planning) in Te Tai Rāwhiti reo revitalisation and Using (Immersion domains) te reo Māori along with unique Te Tai Rāwhiti dialectual variations. There will be a focus on supporting ahikā reo revitalisation activities. Who are the members of Te Tai Rāwhiti Investment Cluster Panel? Connectedness, collaboration, integration and participation across the wider region and within all parts of Te Tai Rāwhiti communities. Innovation, inspiration and motivation, retention and growth in reo ā-iwi, identity – iwi and Māori and to celebrate who we are and our language. What are the priorities for investment? • Māori language use and transmission in homes. Including parents, children and grandparents. What are the key investment areas? 1) Whiua te reo! Investing in opportunities to engage in te reo. This is about prioritising initiatives, activities, events and resources that focus on engaging people who are at the Pou Kaiāwha stage of their language journey. 2) Te reo kia rere! Investing in opportunities to use te reo. This is about procuring initiatives, activities, events and resources that focus on providing Māori language usage opportunities for those at the Pou Tuarongo and Pou Tokomanawa stages. So we will: Convert, Retain and Normalise te reo Māori. What investments were procured in the 2017-2018 investment round? Ngāti Porou: Porou Ariki wānanga, Te Ataarangi, marae, language leadership strategy, hapū, marae, iwi dialect courses & courses. Te Aitanga-ā-Mahaki: Te Whare Korero o Māhaki, Te Ohonga Reo Strategy, Eco Warriors, Eco Revitalization & kura pō. Ngāi Tāmanuhiri: Wānanga Reo, hīkoi & Tāmanuhiri Day. Rongowhakaata: Te Papa Exhibition, wānanga: reo & tikanga, whaikorero & karanga. Rangitāne: Rangitāne Tāngata Reo Strategy, working with Tāmaki Nui a Rua to focus on language in homes and marae, marae & hapū wānanga, whānau reo resource development & learning pods & youth wānanga.